David Abelman, P’11, was promoted to president of the Tufts Health Plan Foundation. He had served as executive director. In addition, he is vice president and deputy general counsel at Tufts Health Plan. He has led the foundation since its creation, when it had an endowment of $38 million and one staff person. The endowment has grown to $75 million, and the foundation now has a staff of four. In 2011, the foundation continued its strategic focus to improve the lives of seniors by providing grants to 76 organizations in Massachusetts and Rhode Island. Andrew Newman has written and produced children’s television for Nickelodeon since 1999. He was a writer/producer on “The Amanda Show,” “All That” and “Drake & Josh.” Most recently, he wrote for “The Troop” and was the head writer for more than 60 episodes of “iCarly.” He is also the executive producer and host of “Celebrity Liar,” an interactive web game show he created for theroomlive.com. He has had recurring and guest-starring roles in more than 30 different television series and has appeared in seven feature films. 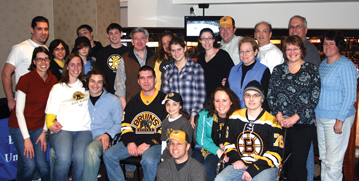 THRILLS ON ICE Alumni, family and friends cheered the Bruins to a 4-3 shootout victory over the Nashville Predators at TD Garden in February. The Alumni CLub of Greater Boston enjoyed a spectacular view of the game from a private suite on the sixth floor. Hal Leibowitz ’82 chaired the event. THE GOOD FIGHT. The family of Gabe Feldman ’82 joined a large group of alumni at Brandeis House in New York City for “Blowing the Whistle on Waste.” The discussion focused on Gabe’s commitment to social justice and determination to right a wrong, which led to New York City officials’ paying the U.S. Department of Justice $70 million to settle the biggest Medicaid fraud case in the city’s history. 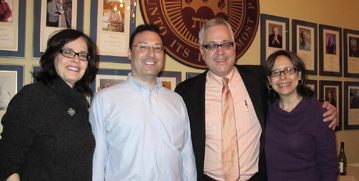 From left: Barbara Kassell, Gabe, and Eli and Lynn Moore, P’13.